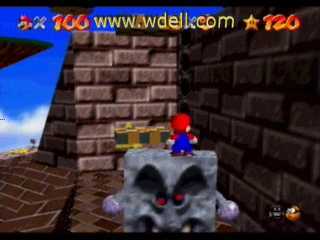 Super Mario 64 - Beyond 120 Stars. Secrets and tricks in course 2 - Whomp's Fortress. On any level with the owl, grab on to him and go way past the course and into the sky. Soon the owl will say, "Lay off the pastas, Mario!" (or something like that). Then he will drop you. At this time, press the 'A' button like mad. If you hit the invisible wall surrounding the level and use the wall kick, Mario will wall kick back onto the owl. Then you can fly back to the course. Sometimes you will go in the wrong direction and will not reach the wall, so I ranked this medium/hard. Can you stand on top of the boss? If you can, he will run around in circles trying to get you. Can you stand on one of the little baby Whomps? Josh says: Try this- Get the Metal Cap, run up the stairs and take out the 2 piranha plants. Then, take a sharp left and go get the one at the beginning of the level. The only thing hard about this is dodging the Thwomps. If you're slowed down by one of them, you won't make it. Chances are, by the time you get to the last one, you're metal armor will be flashing. See if you can get there before it starts to flash. Get Blast away the wall without the cannon. It is possible, I have heard of it being done. 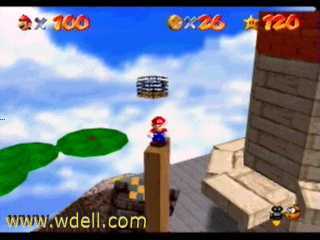 Simply jump to the top of the tower and look at the wall. The star's exposed, but you NEVER BLASTED IT! Now, aim at the star, long jump, and if you're lucky, you'll get the star and never have used the cannon. I consider this Medium/Hard! I have unsuccessfully tried it, but never hit the star. "There and Back" Submitted as an idea. Visitor says: I thought of trick while fooling around on top of the tower. Jump over the side (not off the world) and fall all the way down without touching anything and land right where you started. 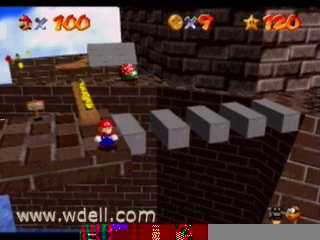 Can you get all the "Red" coins on Star 1 ("A Chip Off Whomp's Block") without the cannon? Here is how you do it! 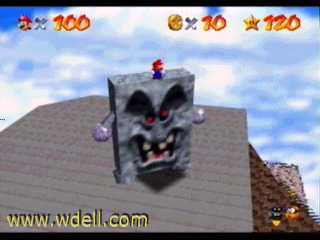 First start the fight with Whomp and lure him to where the arrow is, then get him to fall down so about half his body is hanging in mid air, then jump on him and jump to the arrow and collect the two coins; the rest of them are easy to get! Walk up to any Piranha Plant quietly, without waking it up. Let it hit you when it's asleep. It will wake up after it hits you. Notice that your power meter appeared, but it doesn't have any damage. Cool huh! "Whomp's 1-UP" I'm pretty sure I've found this 1-UP before. 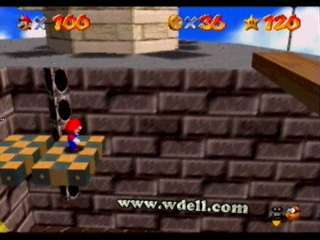 After you beat Whomp, a tower will be there. Stay on the ground, and go to the side with the shadow. Punch it, and PRESTO, a 1-UP! 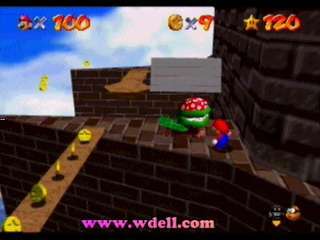 Jump off the top of Whomp's Fortress on to the break apart bridge near the sleeping piranha plant. You need to hear that lullaby music. Get off the falling bridge without waking the piranha plant, and without falling any further. I've gotten 141 coins, although I've heard you can get 143. Here's the hint that was given to me: Get the extra coins from the Whomps! Go to where there is a ring of coins around some flowers. Jump to the brick pillar on the other side of the fence. "Stand Tall on the Plank"
Try to stand on the wooden plank that you normally kick over (without kicking it over). Kick over the wooden plank, then try to jump to it from the elevator platforms (and land without falling). "Who Who Needs The Owl?" Play "Fall into the Caged Island", but get to the star (in the caged island) without using the owl! There are two methods I know: One method is to use the cannon, the other method is to jump from the tower (you may have to play a different level for the tower to be there).